Not given yet but happy with delivery process. Highly recommend this bag. The more it's used the better it looks. Top quality item. Adjustable strap has excellent length sitting very comfortably on the shoulder. Lots of space and compartment options. Lovely quality and finish to product. Our laptop bags can be used for school, work or just as an everyday bag for the modern man who needs his laptop wherever he goes. 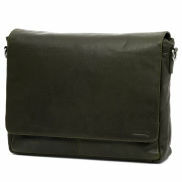 We produce most of our laptop bags and only use leather of the highest quality. A full 4-year warranty is included for each bag. 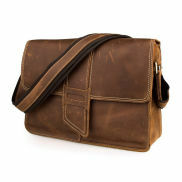 Most men want their computer bag to be made out of leather. A laptop bag must be able to contain your laptop and all its accessories. It should also have enough room for your business papers or schoolbooks, as well as all your mobile gadgets and accessories. 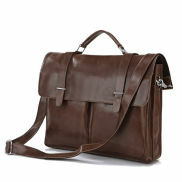 Two important things to note when it comes to leather bags are dimensions and quality of leather. What really distinguishes a computer bag from a regular shoulder bag is that the former usually has about the same shape as your computer. The dimensions of both are similar both in height and width although a computer bag is often no thicker than about 10 cm. A computer bag can have an extra padded compartment for a laptop and feature quick access pockets for smaller items like your mobile phone, wallet, keys, etc., allowing you to have all of your stuff in one organised place. If you travel frequently, you'll need a computer bag with a padded compartment designed for laptops, notebooks, and tablets. That way, you'll enjoy peace of mind that your precious cargo will be safe upon arrival to your destination. You could also opt for a bag without the padded compartment, freeing up a lot of room for other items not sensitive to bumps and accidental drops. A computer bag in leather should be treated like any other leather case, but only on its outer surface. A good rule of thumb is that the softer and less treated the leather is, the more maintenance is needed. But if its surface is very smooth, meaning it was highly processed, then vigilant maintenance may not be needed. A cruderleather bag will greatly benefit from an initial waterproofing spray application and, if the leather looks a little dry with its colour getting duller, then also both leather grease and oil treatment.